Life is far too short for avoiding cakes altogether. 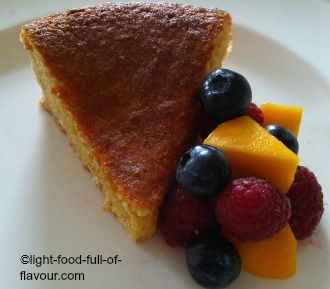 My website may be about light food full of flavour but I also believe that a little bit of the “naughtier” side of food – those things that tend to include butter and sugar – is seriously good for the soul. 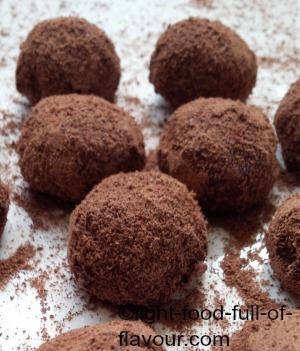 I have also added a recipe for raw chocolate truffles in amongst the cakes. 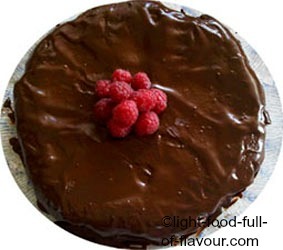 Welcome to chocolate heaven - double chocolate cakes with hidden raspberries inside. 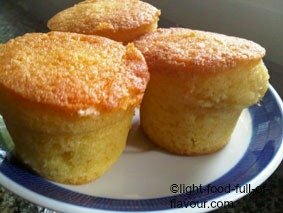 These little almond lemon drizzle cakes are perfect both as an afternoon treat with a cup of tea or coffee, and as something to round off a meal with. 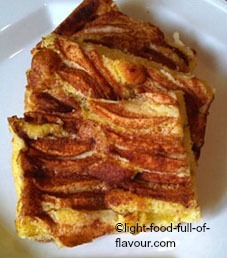 A wonderfully moist Swedish apple cake with cinnamon. A rich and truly divine French chocolate cake that is perfect to serve as a dessert. 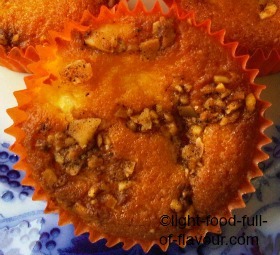 Moist Devon apple cakes with a crunchy nut and cinnamon topping. These litttle beauties are super-yummy. Tasty and healthy chocolate - really! Well, my raw chocolate truffles are full of healthy nutrients and delicious. A super-delicious lime and almond cake made with lots of ground almond and just a little bit of spelt flour. 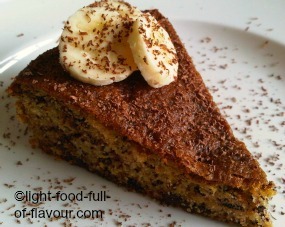 You have got to try these moist and super-delicious banana and chocolate cakes! 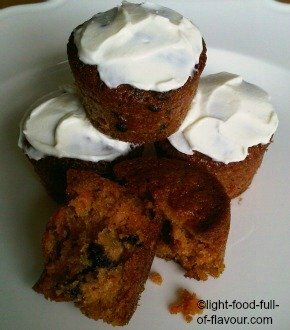 Moist and irresistibly delicious carrot cakes. 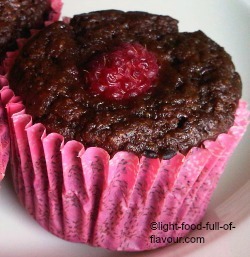 Delicious chocolate and raspberry brownies made with low-GI xylitol - a natural sweetener. 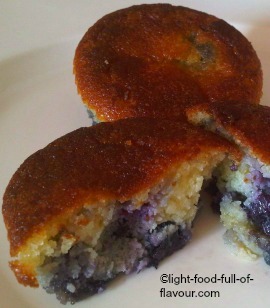 Super-moist and really delicious gluten-free blueberry cakes. 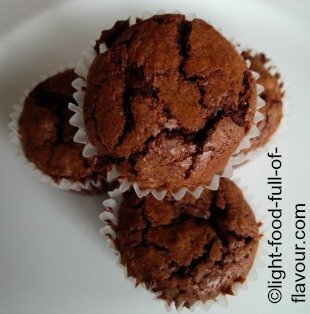 Tasty and healthy cakes - is it possible? 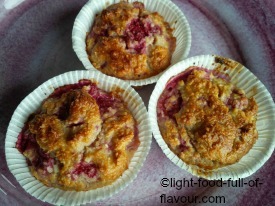 My gluten-free raspberry muffins are also lactose-free and, if you leave out the honey, sugar-free as well. 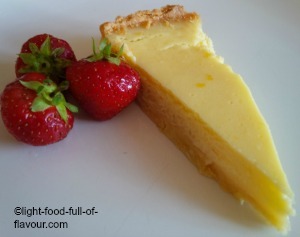 If you want to wow your guests, make this ultra-delicious lemon tart. I've started to use xylitol - which looks and tastes like sugar but has very little effect on raising your blood sugar. I read about xylitol a while ago and finally got around to trying it. And now that I have, I won’t use sugar again. Xylitol is a vegetable sugar which is similar to fructose in fruit and has a very low GI. I’m not sure if it’s sold in super-markets. I buy it in a health food shop. I like my cakes to be a bit tart and I also want them to be both moist and light. If my cakes are not slightly tart and moist, then they are filled with seductively dark chocolate and moist. As for ingredients, I would NEVER substitute butter with margarine or some other horribly manufactured spread. My carrot cake though - as are carrot cakes in general - is made with sunflower oil, not butter. I’ve said it in other places on this website that I use organic eggs most of the time. I will use free-range eggs if I can’t get hold of organic eggs, but not eggs from caged chickens. And when it comes to equipment I am quite bowled over by all the silicone bake-ware you can find nowadays and I use them a lot. These days I also travel with electronic scales. There are different ways of measuring, depending on what country you are from, but weights are more exact and that’s what I’m sticking to now. You can buy good electronic scales at a very reasonable price.